Many online slots celebrate nostalgic memories of childhood - whether it's classic cartoons (Blueprint Gaming's Casper's Mystery Mirror), video games (IGT's '70s-themed Centipede) or the Saturday run to the sweet shop (anything from Leander Games), but slot developer Cryptologic's Sunday Afternoon Classics is all about the old-fashioned romantic films from the 1930s and '40s. Slushy classics like Gone With The Wind, Casablanca, His Girl Friday, and Hostel (only joking) are celebrated in this lush-looking 5-reel, 25-payline release from leading slots bods, Cryptologic. We go all pastel tones on the reels in Sunday Afternoon Classics, so there are plenty of pinks, pale greens and blues in the symbols, while the backdrop is a gentle rolling countryside scene. The symbols consist of - as well as frilly 9-to-Ace symbols in those pastelly colors - a huge Southern house, flowers and love hearts, our strapping hero on horseback, plus a feisty Gone With The Wind-style gal who acts as the game's Wild. 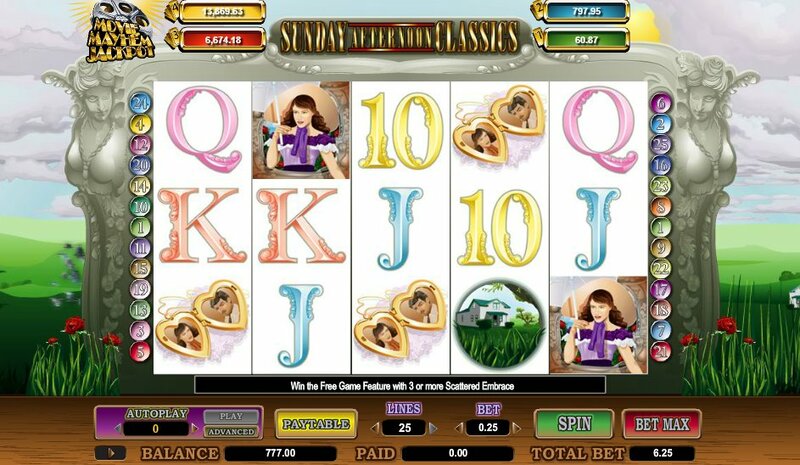 This southern belle subs for all symbols in the game other than the Scattered Embrace, and five Wilds pays a lip-smacking 6,000-coin jackpot. All Wild wins earn a thigh-smacking 3x multiplier too. The Embrace Scatter triggers free spins when you land three or more on the reels anywhere. 10 spins are awarded with - like the Wild wins - a 3x multiplier applied to every win. Spins can be re-triggered by hitting three or more Scatters. There's Also the Movie Mayhem Progressive Jackpot! If 10 free spins (albeit with a tasty 3x multiplier applied) doesn't float your boat, the progressive jackpot might. Sunday Afternoon Classics forms part of Cryptologic's Movie Mayhem Jackpots slots, where a real-money jackpot is awarded at random. You will be presented with a series of items - pick 6 and the more Movie Tickets you find, the bigger your jackpot. In terms of easy-going slots fun, this is perfectly fine: the graphics are nice enough, the animation looks good, and the bonus round easy to hit. I couldn’t get the Progressive to trigger (not that that's a sign it's more random than the pay table suggests) but there's enough here to make me want to try. Sunday Afternoon Classics certainly isn't just for Sunday afternoons.